Space is full of hazards, so the last thing you need is a whole other universe where your ship has to face an entirely new existence stuffed with perils. This is the problem when you fall into a Gravwell: You find yourself drawn through a singularity and you have to fly your way out. Sure, there are a number of competitors in the same predicament, but that simply affords you several other gravity fields you can use to your advantage. The object is to emerge from the Warp Gate first. 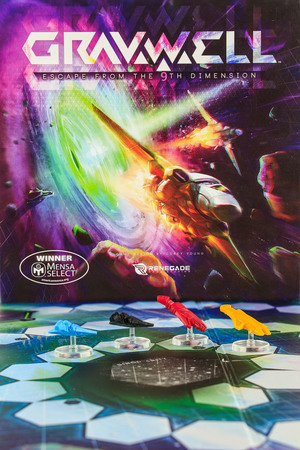 Two to four players command ships trapped in another dimension at the other end of a black hole. Fortunately there appears to be a gate here that teleports things back into the “normal” universe – not that it helped the two derelict spaceships that float aimlessly along this same path. Everyone wants out of this hole in space, however, so the race is on around a board that spirals outward from the Singularity toward the exit. "Like a circle in a spiral, like a wheel within a wheel"
Gravwell lasts six Rounds and each Round starts with Fuel Cards dealt into several small piles, a facedown card topped by a face-up one. Players take turns drafting these little stacks – they know the top card but not its partner. These list a number as well as an element and its chemical symbol, and they are used to move about the gravity well using standard movement, Repulsors, and Tractor Beams. Once all cards are selected every player has a hand of six. Rounds are further divided into six phases during which everyone chooses one card from their hand and reveals it. 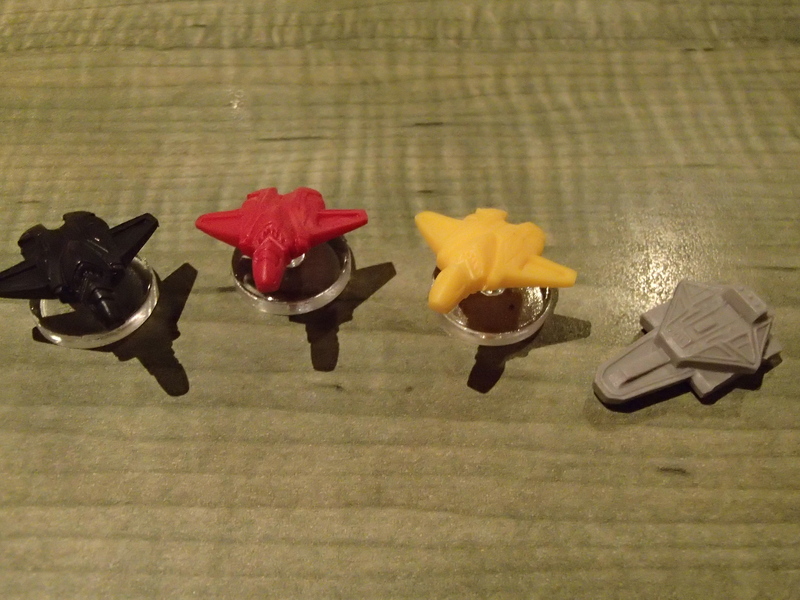 These determine player order for the turn and the distance moved. It goes alphabetical by chemical, so someone with Lithium (Li) 4 goes before someone who chose Thorium (Th) 2. Even then movement isn’t exactly up to the captain so much as the force of gravity from all these ships and the type of movement listed on the card. It would be great if standard movement went right for the “exit,” but the movement from these cards is toward the nearest spaceship; if the closest is behind one’s position along the track, a Lithium (Li) 4 actually takes that craft backward four spaces. It might be more useful to pull out the Repulsor Card, which moves one’s ship away from the nearest ship, or the Tractor Beam that doesn’t move the vessel but instead pulls in every other ship, in front or behind. Since everyone chooses their card at the same time, though, no one knows for sure whether the card played is going to be an advantage, a disadvantage, or a complete waste of time. If one is about to lose too much movement from the card he played, he can instead, once per Round, play his Full Stop! card and cancel his momentum for the phase. "Scotty, more power - give me full KrPuQt"
Using the positions of other ships (including a couple of derelicts that serve as stark reminders about what happens to those lacking in innovation), players get pushed and pulled along the path until someone makes it out of the Warp Gate to freedom. If, at the end of six Rounds, no one has made it out, the player farthest along wins. Simplicity breeds simplicity, so the components here are straightforward. The board is broad enough to accommodate all the black hole’s victims, the cards are bright and clear, and the ships are . . . well, they’re certainly a nice mold, though it’s worth noting at least this copy had one ship no longer attached to its base when the box was opened. Other than that it’s an attractive little game. The rules are pretty transparent, though they contain one fatal flaw: The marvelous example of play, the kind of thing any gamer wants to see in his instructions so he knows he’s doing things right, unfortunately holds rules not listed elsewhere. To get a full account of the mechanics one must read the whole book and that sends you looking for rules where there ought to be only clarifications. 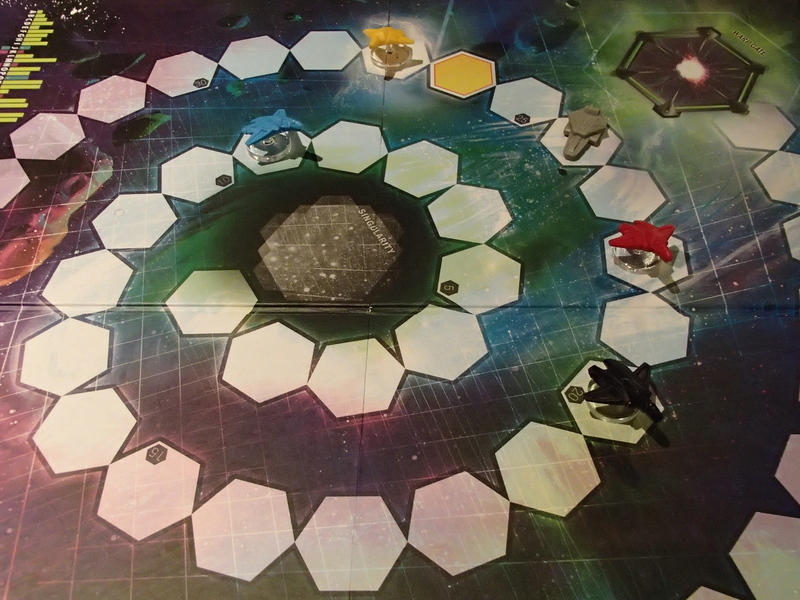 Gravwell is a brief game, and chances are it’s too brief for some. It’s a lot of fun jockeying for position, especially since one must do it almost blind, but what seems like an impossible goal – getting to the exit – turns out to be the sort of thing that suddenly just happens . . . and when it does, oh, how you want another shot at it. Fortunately you can since, when they suggest playing time is 20 minutes, they mean it. Get the hang of it and it can go even faster. If you don’t like randomness in any capacity it may be a turnoff since results not only depend on each other’s ships but on each other’s card plays, but for the rest it’s delightfully frustrating. If shown in any other incarnation this game might look staid or familiar – there’s already Magical Athlete, as one example – but others in this vein seem intent on layering on added mechanics that serve only to make gameplay more colorful and complicated while minimizing the direct effect of player input. What they don’t make it is more fun. Stripped down to the essentials seen here, Gravwell is point-to-point movement with a high dose of chaos and a strong element of groupthink. (And if you can count cards that helps a bit too, though there are always at least a couple of cards no one sees each round.) Easy to learn, absorb, and play, it’s the kind of thing that works as either an intermediate game between other, bigger adventures or as an evening’s entertainment through repeated play. 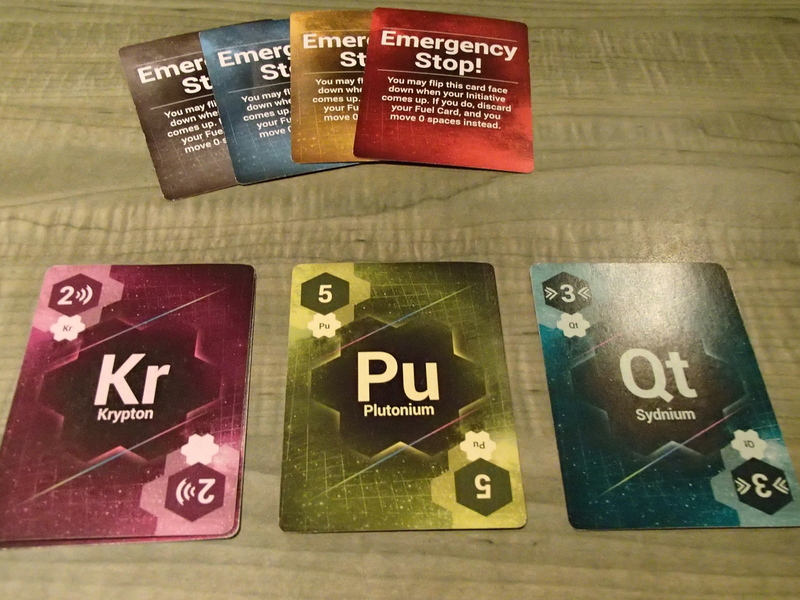 Even if the core mechanics start to wear thin, Gravwell has other options for random Fuel Card play, open card hands for added strategy, and even solo excursions. Such light entertainment from a game based on gravity.